Baseball fan and community leader Conrad “Cooney” Grauer (1905-1993) called the Bronx neighborhood of Kingsbridge his home for over 60 years, and was instrumental in the founding of the Kingsbridge Little League in 1951. An avid ballplayer, Grauer dreamt of a professional career. While his major league dreams never materialized, Cooney did all he could to help the children in his neighborhood pursue their own. This site was acquired by Parks by condemnation on December 12, 1950. Five years later, Cooney began to work with Parks to transform the field into a safe and beautiful space for neighborhood baseball games. For nearly 35 years, Cooney nurtured the field and helped out with Little League practice. In all his years of service, even when he was in his early eighties, hardly a day would pass when Cooney was not out tending the field. In 1974, Local Law No. 39 named the field in Grauer’s honor; this is one of Parks’ few properties to have been named after a person who was still alive. In 1989, Cooney retired at the age of 84. He passed away in 1993 while staying with his family in upstate New York. Over time, due to poor drainage, the outfield sunk well below the infield. In 1993, Parks leveled the outfield with landfill and new topsoil was acquired through local donations and fundraising. 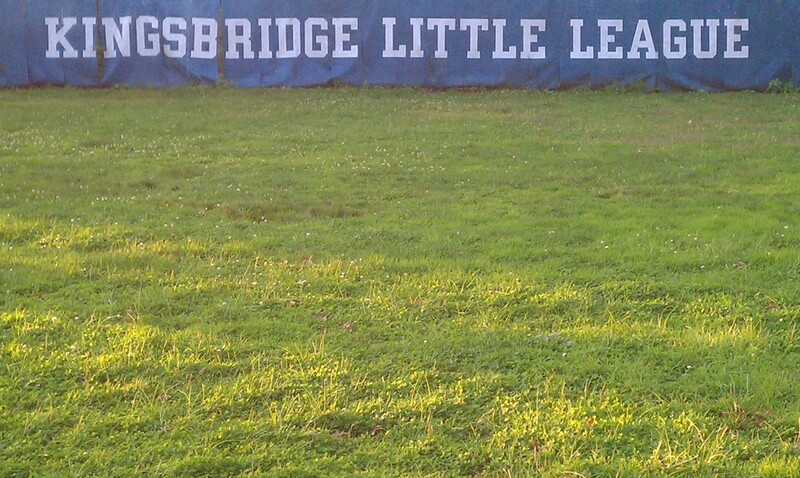 In 1996, Parks also installed overhead lights in the outfield, to provide for night games for the Kingsbridge Little League. Bounded by West 233th and West 234th Streets and Bailey Avenue, Parks acquired this site on December 12, 1950 in conjunction with the construction of the Major Deegan Expressway. Cooney Field is one of six disconnected parks, ranging in area from about one-tenth of an acre to about four acres, that were laid out bordering the Major Deegan Expressway. Major William F. Deegan (1882-1932) was the son of Irish immigrants and studied architecture at Cooper Institute. During World War I, he served first as a staff officer of the 105th Field Artillery and later as a major with the Army Corps of Engineers under General George W. Goethals, where he oversaw the construction of army bases in the New York City area. Deegan also served as president of the Bronx Chamber of Commerce, as Mayor James J. Walker’s Tenement Housing Commissioner, and as chairman of the Mayor’s Committee for Welcoming Distinguished Guests. On April 30, 1937, Mayor Fiorello H. LaGuardia renamed the westerly approach to the Triborough Bridge the Major William F. Deegan Boulevard; when the boulevard was lengthened in 1956 it was renamed the Major Deegan Expressway.